In 1958 a several-hundred year old painting of Jesus Christ was auctioned in England for a hundred bucks. 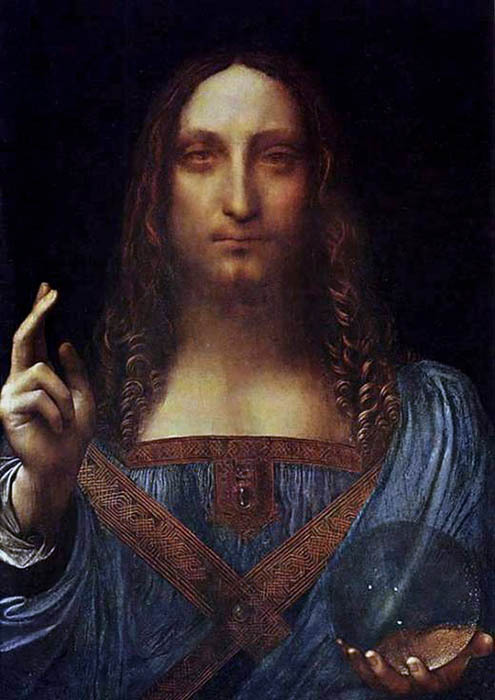 Last November the very same painting — now purported to be a long-lost Leonardo — was purchased for more than 450 million dollars by Saudi prince Bader bin Abdullah bin Mohammed bin Farhan al-Saud at Christie’s auction house in New York, making it the most expensive single object in all of human history. It’s not inconceivable Leonardo once had something to do with the painting. There are two sketches for the drapery on Christ’s right arm in the Windsor Castle Royal Library that are unquestionably by Leonardo’s hand. But the similarity ends there. Never mind that Prince Bader’s “Leonardo” has been heavily repainted over the years by various restorers. The painting’s core execution is mediocre. Check out Christ’s stiff pose, his dull expression, and the pedestrian quality of the painting of the glass sphere in his left hand – The Mona Lisa this ain’t. Maybe Leonardo sketched it in, and one of his assistants knocked it out. Maybe he even touched it up here and there. Who knows? Who cares? The experts passing this thing off as a real Leonardo are incompetent at best and disingenuous at worst. B) they listen to art-industry professionals who either have no idea what they’re talking about or are complicit in a scam. Humans have prized certain objects highly for a long, long time. Back in the cave days our ancestors likely believed the small ivory carvings they carried about with them were conduits for magic forces. When cities and states came along, art objects were displayed in temples to project power. Throughout history, valuable art objects have conferred status upon their owners. Today many art collections function purely as diversified portfolio investments. In this setup collectors, acting on the advice of paid art consultants, routinely buy blue-chip artworks and ship them directly to climate-controlled storage units, where they sit until they’re sold to the next party. People who don’t personally understand what they’re looking at might want to avoid this kind of activity. During the 1930s and 1940s, Han Van Meegeren faked several Vermeers that netted him tens of millions of dollars. Looking at those clunky compositions today, it’s hard to believe anyone could have been taken in by such obvious shams. Knoedler & Co., the oldest gallery in New York, closed its doors in 2011 after being busted for selling eighty million dollars worth of fake Mark Rothkos, Jackson Pollocks, and Willem DeKoonings that it turned out were all painted by a Chinese immigrant living in Queens. In one especially egregious case, Pollock’s signature on the painting was misspelled. Andy Warhol is reputed to have once said, “The best form of art appreciation is to write a check.” To which we might add the Latin dictum “Caveat Emptor” – Buyer Beware.